Got a small living room? Not sure how to decorate it? Having trouble getting it just right? While decorating small spaces can be a challenge it is not impossible. There are plenty of decorating ideas for small living rooms. The key is to keep it simple and to scale. While your space might be limited, it is important to have ample area for pathways to ease traffic flow in your living room. Make sure you don’t overcrowd. One way to do this is to think vertically. Get things off the floor and utilize wall space. Tall chests, built-ins or bookcases will take advantage of the room height when looking to store or display items. Even better, try using wall mounted shelves in lieu of bookcases. Consider how you will be using the room. If it is to be used exclusively for conversation, reading and entertaining then relegate the electronic equipment to the family room. If you must incorporate a TV and other electronic entertainment devices into the space then use smaller items in keeping with the scale of the room. Sorry guys, no 58” plasma TV in here! Is your living room adjoining another space such as the dining area, or serving two functions as a living and office space? 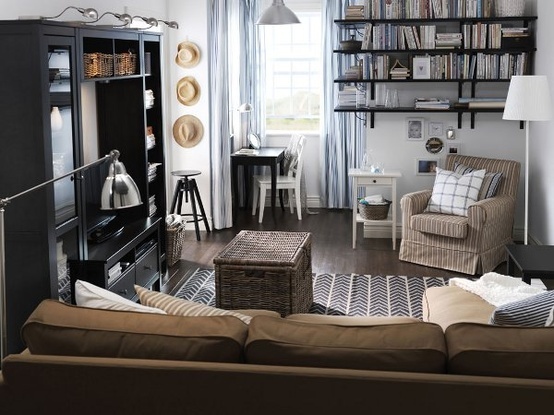 A good decorating idea for small living rooms is to use an open two sided display/bookcase to delineate areas. Aside from having less visual weight than a solid bookcase, an open case provides extra storage and display space while not blocking light. The openness also allows the eye to travel further in the room. Neutral, light colour schemes work well in small spaces. Using light colours will make a room appear bigger. 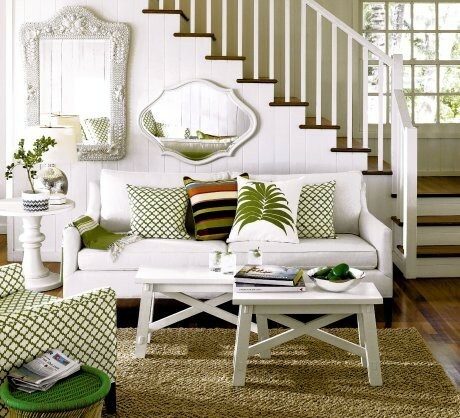 Think about using whites, creams, tans or light taupes, all of which are light and neutral. 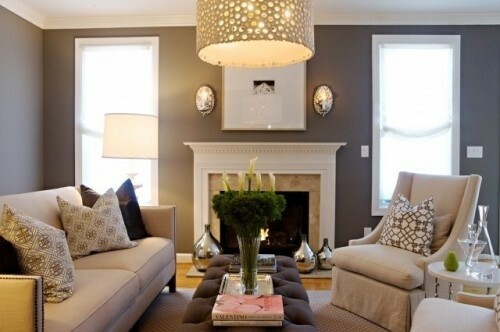 If neutral is not your style that’s ok, but whatever colour you choose make sure to paint the room one solid colour. No colour blocking here! Painting the room all one colour allows the eye to travel freely around the room without interruptions from colour changes which can make the space appear smaller. Keeping it simple also applies to your decor finishes. Don’t introduce too many patterns in your décor, like upholstery for instance, and keep the patterns simple. Think understated. Regardless of your choice of flooring, keep it continuous. Flooring changes will interrupt the flow and tend to make the space look smaller. Clear uninterrupted lengths of hardwood flooring look great and work well in small spaces making the space appear longer and wider, but sometimes you want a little comfort underfoot. If you must use an area rug, make sure it is big enough to cover almost the whole area. Another way to get the most out of your small space is to carefully choose your furniture. Use smaller scale furniture. Look to stores who cater to condo owners like West Elm, for instance, who sell furniture scaled to small space living. Consider also the furniture’s silhouettes. They need to be taller and thinner therefore having a smaller foot print on floor and utilizing wall space. Dual –purpose items are also ideal for small spaces. Look for ottomans with storage or coffee tables with drawers. Nesting tables are great also as they provide extra table surface and easily stored when not in use. The visual weight of the furniture is also important here. Clear acrylic furniture or glass top tables, sofas and chairs with exposed legs with no heavy skirts, furniture with open bases and simple silhouettes all have carry less visual weight which is ideal for a small living room. Using furniture with reflective surfaces will brighten a room. A mirrored chest or side table has less visual weight than a dark solid wood piece and can increase light in the room by reflection. Don’t like mirrored furniture? 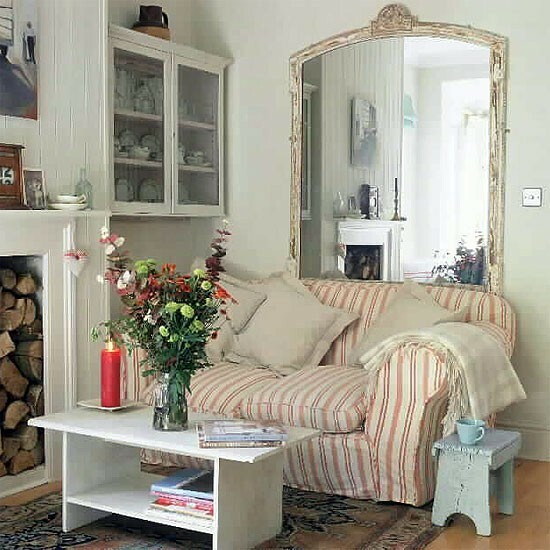 A great decorating idea for small living rooms is to lean a large floor mirror against a wall. The reflective surface will not only increase light in the room but give the appearance of more space. Do consider, however, the placement of the mirror. You will want to be aware of the space opposite the mirror as that is what will be reflected. If your mirror reflects the mess of shoes and coats in the hallway, the deception of more space found in the reflection will not be an appealing one. If you have a great view, try keeping your window treatments minimal and your view unobstructed. This will allow the eye to travel through the room and beyond to the vista outdoors thus giving the feeling of more space. If your view is less desirable, keep your window coverings simple. No fussy, fancy drapes here. Choose tailored, clean lines instead. Tailored shades or simple curtain panels will do. Fabrics should be in a simple pattern and/or in a colour which blends in with the walls and doesn’t stand out too much. The idea here is to not create a frame for the window distracting the eye and breaking up the length of the wall. Not to be overlooked, lighting is extremely important when decorating a small space. As floor space is limited, this is the perfect place to utilize pot lights in the ceiling. Make sure to keep them small and discrete. Of course, as overhead lighting is often not the most flattering light for many of us, you will want to have some soft accent lighting. If using floor lamps, make sure they have a small foot print so as to not take up too much space. Better yet use table lamps or wall sconces. 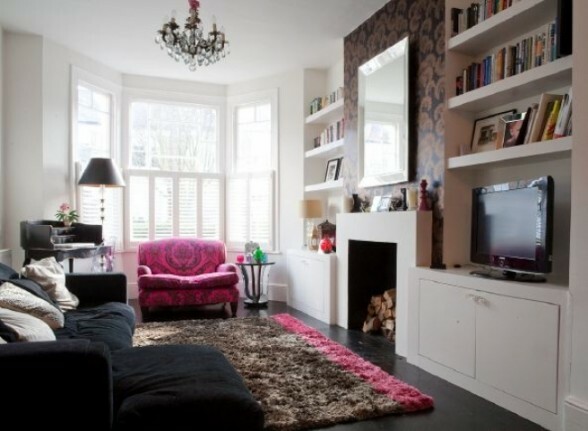 What about this decorating idea for small living rooms? Try wall mounting a reading lamp next to your favourite reading chair or at either end of the sofa. This provides great light for reading and gets the light off the floor and potentially smaller sized tables. Whether you are starting out in your first small home, live in a condo or apartment, or have down sized, having a living room in which you feel comfortable to relax or entertain is important. Cramped quarters do not have to cramp your style. 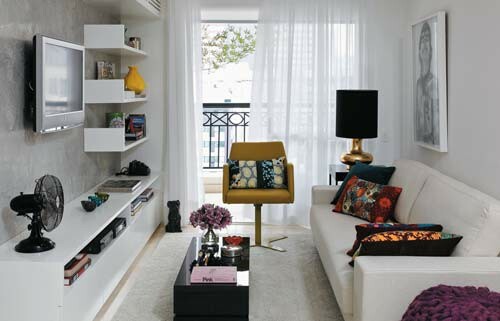 There are many decorating ideas for small living rooms out there today which offer solutions to challenging small spaces. Small living rooms can be cozy and charming. Keep it simple and to scale and you can still have a room that is big on style.